Bert Greene was a pretty fair golfer in his day. At the age of eight, he was beating some of the duffers at the Dublin Country Club. Forty years ago Greene was in his prime as one the leading collegiate golfers of the Southeastern Conference. Ten years later his PGA career vanished as a result of a freak career ending injury. Charles "Bert" Greene was born in Gray, Georgia on February 11, 1944. He took up golf at the age of four. In 1950, Bert’s father, Herb Greene, was hired to be the club pro at the Dublin Country Club. Growing up around golf and being the son of a pretty good golfer, Bert was destined to excel on the links. In his days in Dublin the elementary school student outscored several grown men when he finished atop the 2nd flight. The Greenes left Dublin for Jacksonville, Florida for a short time before returning to the Middle Georgia area where Herb worked on golf courses in Eastman, Douglas and Cochran. Bert’s sister Barbara also followed in their father’s footsteps and played for a time on the LPGA tour. In 1961, Bert, playing for Dodge County High School, won the Georgia AA state championship by nine strokes with a two straight sub-par round total of 136. Later that summer, he captured the Georgia Jaycee’s Jr. Championship. The following year, the Dodge County golfer won the 17-18 year old bracket of the Future Masters of Golf with a three round score of 210. Greene was awarded a full scholarship to play for the University of Tennessee golf team in 1963. That same year Bert was the Tennessee Amateur Golf champion. In 1964, Bert won the individual championship in the Southeastern Conference and garnered All American honors that year as well as his junior season in 1965. Bert played as an amateur in his first U.S. Open in June 1965, but failed to make the cut. Greene’s first appearance in the Master’s Golf Tournament in Augusta came as an amateur thirty-nine years ago this week in 1966. He qualified for the tournament by finishing in the top eight of the previous year’s national amateur tournament. In his first practice round, he posted a 71 with birdies on 13, 14 and 16 with a 20 foot eagle birdie put on the 15th hole. Bert missed the cut after decent opening rounds of 80 and 77. In the fall of 1966, Bert decided to turn pro. He attended a tour school but needed a sponsor to pay the bills of entrance fees, travel expenses and lodging. Two men in the beverage business signed on to sponsor the up and coming golfer. Greene started out strong in the opening round of 1967 Los Angeles open. He was among the third round leaders of the ‘67 Tuscon Open but fell back to a distant and even par behind Arnold Palmer, the tournament winner. But after a disappointing rookie year when he brought home only $1,702.57 in winnings, Bert was left without a sponsor. Buck White, a former golf pro, saw a lot of potential in the tall, slim and blonde fellow Tennessee golfer. He convinced an eclectic group of investors to sponsor Bert for the 1968 seasons. The group included a Florida housewife, a lawyer, dean of a Quaker school in Garden City, N.Y., a toy merchandiser and a mysterious man with a funny sounding name. 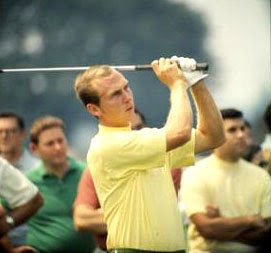 In March 1968, Greene once again soared to the top of the 3rd round leader board. Following an outstanding start, Greene was in 8th place, seven strokes off the lead, six ahead of Jack Nicklaus and nine strokes ahead of Lee Trevino. In The Dural Open, just as he had done a year earlier in Tuscon, Greene fell off the leader board following a poor fourth round. A highlight of the year 1968came in Minnesota when Bert, listed as playing out of Union Point, Ga., scored a hole in one in the Minnesota Golf Classic. Bert’s fortunes turned for the better in 1969. After participating in the U.S. Open, Bert finished 11th in the Kaiser Open ahead of golfing legends Hale Irwin and Sam Snead. He was an early leader in the American Golf Classic and the Buick Open. His best tournament of the year came in the Western Open, the world’s richest tournament. After blistering rounds in the 2nd and 3rd rounds, Greene drew within one stroke of the leader in the final round. Going for the green in two, his ball found the trap. Still in contention, he missed a putt, which cost him $20,000.00 and his first tour victory. Bert had a great outing when he finished 4th in the Greater Hartford Open on Labor Day weekend. He finished the year 23rd on the money list with $56,878.00 in winnings. Bert returned to Augusta National in 1970 on an ominous note. During the practice round, one errant shot landed in an empty lunch box. He finished 12th in the tournament with a highly respectable even par four round total of 288. Two weeks later, Bert finished 5th in the Tallahassee Open. He continued to play well during the spring, finishing 3rd in the Houston Championship and 13th in the Atlantic Golf Classic. In one of his first professional victories, Bert captured the Brazilian Open title in June. Fighting bursitis throughout the summer, the lanky power golfer was the first round leader of the Green Island tournament before falling to an 8th place final finish. Greene got off to a good early start when he placed atop the leader board in the 1971Glen Campbell Open. A second victory on foreign soil came in the Lagostas in Bogota, Columbia in February. For the second straight year, he finished 12th in the Masters. Among his better tournaments that year were the Atlanta Golf Classic and the Kemper and Colonial Opens where he was among the early leaders. His best finish came in the Western Open when he placed 6th. The year 1972 proved to be a turning point for Bert. He only managed to finish 32nd in the Masters, though he finished ahead of Arnold Palmer and Lee Trevino. His best finish came with top ten finishes in the Houston and Greater Milwaukee Opens and a sixth place finish in the Colonial. His career nearly came to an end in the fall when during a round of golf, Bert became frustrated with a bad shot, slammed his club into his golf bag, and caused a pistol inside his bag to discharge. The bullet struck Greene in the foot nearly ending his golf career. Six years of traveling all over the country playing hundreds of rounds of golf finally paid off for Bert Greene in 1973. Bert finished 5th in the Byron Nelson Tournament in April and the BC Open. In September, he finished 12th in the Heritage Golf Classic. But in was in Raleigh, North Carolina when finally Bert won his first PGA Tournament. After four rounds of regulation play, Bert was in first place in the L&M Open with a score of 68-73-67-70 (278) when on the last hole, Miller Barber sunk a 40 foot putt to force a playoff. On the 5th playoff hole, Bert sunk a twenty-foot twenty-thousand dollar putt to cinch his first tour victory. Back at home in Dexter, Georgia, where his father was the golf pro at Green Acres Country Club, his parents Bert and Kathryn were ecstatic. Just before the tournament, Bert spent a few days for rest and relaxation. "For the first time in his pro career, the pressure is off," his father said. But things didn’t get better for Bert. A wrist injury signaled the end of his once promising career. He finished last in the first round of ‘74 Masters and missed the cut. Two weeks later he rebounded with a 21st place finish in the Tournament of Champions. His one highlight came when he shot a 67 and was one stroke off the lead of the World Golf Open at Pinehurst in September. In that same tournament a year later, he finished 53rd and took home only $476.00 in prize money. It was one of his last tournaments as a touring professional. After leaving the tour, Bert Greene became a Mississippi state trooper. For nearly two decades Bert Greene almost abandoned the game which brought him fame and enjoyment, playing an average of only three rounds a year. He was the first PGA tour victor ever to regain his amateur status. At the age of fifty, Bert attempted to join the Senior Tour. He missed the cut and decided to permanently retire to enjoy the things he loved the most, his family and fishing. When asked if he had any regrets, he told a reporter, " I have no regrets. I knock on wood because I have two great kids and a grand boy, Jacob." Sarah was an average girl, one who grew up in the Great Depression and one who knew the value of hard work and a good education. Like many young women of her generation who were lucky enough to obtain a post secondary education, Sarah decided she wanted to teach. One of her first assignments found her in Pine Hall, North Carolina, a small community, not large enough to be called a town, and situated a good half hour or so north of Winston - Salem in those days of slower cars and dirt highways. Returning from a trip back home to Monroe, Sarah was standing in the bus station on a Sunday afternoon in Winston-Salem. School was about to be out for Christmas holidays. A nervous voice came out of the loud speaker. The passengers paused. "All service personnel report to their bases immediately! The Japanese have bombed Pearl Harbor," the announcer quivered. Sarah and other stunned civilians were diverted to other buses while the soldiers and sailors boarded the first available buses back to their posts. Following the dramatic attack on the United States, men across the country began signing up for volunteer service or selective service through the draft. The officials of the Stokes County draft board figured that teachers were good at taking names and putting them on lists, so Sarah and the other teachers were assigned to register the men of the county for the draft. The young teacher had heard that a new organization was being formed to aid the war effort. The Marine Corps Women's Reserve was established in February 1943. These women were given hundreds of tasks to perform, serving as radio operators, cooks, truck drivers, map makers and hundreds more. By D-day, five of six enlisted personnel serving in the Marine Corps Headquarters were women. Two of three Marines manning major posts in the United States and Hawaii were female in the last years of the war. It was time to serve her country Sarah decided. She traveled down the road to Camp Lejeune, a bustling military installation, which two years earlier had been nothing but a sandy forest of natural pines along the Atlantic Seaboard Railroad. The First Marine Division had come there two years prior to train for the eminent war. The camp would be Sarah's home for six weeks. Though it looked like a college campus with beautiful buildings, the Marine post was specifically designed to train men and women to go to war, which meant that some would kill and some would be killed. Her fellow Marine reservists were an assortment of women from all walks of life. Sarah and the other women were subjected to a battery of tests. When they weren't testing and being taught in some facet of military science, they marched. They marched to eat. They marched to classes. They even practiced marching just to learn how to march with no destination. They stopped marching when the drill instructor was too tired to watch the women march any more. Sarah was taught how to walk, talk, run, eat, sleep, drink, dress and think like a Marine. After boot camp, Sarah wanted an assignment somewhere at an air base. To get there, she first had to go to Cherry Point, just across the river. Much to Sarah's astonishment when she arrived at Cherry Point, she was assigned duty in the kitchen. Turkeys for Thanksgiving, turkeys for Christmas, and leftover turkeys for New Year's Day are still ingrained in Sarah's memory of her first real days in the Marine Corps. She did get New Year's Eve off to celebrate the coming of the year 1944, a year in which the war, both in Europe and Pacific, would soon turn in favor of the Allies. Just a few days later, Sarah rode a troop train to Oxford, Ohio, where she began taking courses in the operation of radios, learning how to type and send messages in Morse code. Sarah trained alongside her counterparts, the WAVES of the United States Navy. She had hoped that her marching days were behind her, but on nearly every Saturday the Marine women joined the WAVES and practically every sailor and marine on an old athletic field for a weekly parade. The marching subsided after that, although Sarah does remember a blistering hot day when she marched in her wool uniform, a disastrous result because the military too frequently goes by the calendar and not the thermometer when assigning uniforms for the day. On May 27, 1944, Sarah was promoted to corporal and assigned to the Radio Material School in Omaha, Nebraska. She learned how to put radios together, take them apart and fix them when they were broken. Sarah delighted in the fact that she had two friends who accompanied her through both Camp Lejeune and Oxford. One was an English teacher. Sarah taught math before she enlisted. In October 1944, Sarah traveled across the country to report for duty in Santa Barbara, California. During her 14-month stay in the Golden State, Sarah earned a third stripe on her sleeves. She continued to repair radios at naval and coast guard stations, enjoying the latter the best because of the great food they served. Southern California is, and was then, a great place to visit. Sarah and her friends often hitch hiked, with absolutely no fear of harm, to Los Angeles and San Francisco for a weekend of entertainment. Just a dozen days before Christmas, with their discharges in their hands, Sarah, her friends Avis and Ann, Avis' nephew and his dog piled into a '39 Plymouth set out for their homes along the route. They drove through glamorous Los Angeles, the frozen deserts of Arizona and the snowy plains of Nebraska. They slept in their cars and $3 a night dingy cabins, though they did spend one warm night at Ann's house in Nebraska. As Avis and Sarah got closer to North Carolina, they began to notice snow on the ground. But Sarah couldn't make herself believe there was any chance of a snowball at her home in Monroe. There was snow in Asheville. Sarah's hopes of a white Christmas swelled. As Sarah and Ann pulled into the Austin home in Monroe, it was snowing. It snowed so much that Ann had to spend a couple of days with the Austins, a delay she minded very little with all of the southern holiday hospitality which was heaped upon her. Sarah said goodbye to the last of her trio as she began the last leg of her cross country trip back home to Boston. The girls were home. The war was over. All was good in Nebraska, Boston and especially in Monroe, North Carolina where this young school teacher turned Marine was home for Christmas. Sarah taught school in Winston-Salem for 17 years. She married Bill and moved to Dublin. 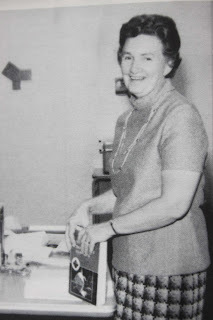 I was lucky enough to have been her student for two of the twenty-one years she taught math in Dublin. Sarah had a passion for geometry and geometric shapes. At Dublin High she was legendary for her assignments of geometric art. While we struggled to construct our 3-D stellated polyhedron stars, we would have sworn such an arduous task would only have come from a demanding Marine Corps sergeant. Little did we know that our teacher was actually a Marine sergeant in World War II three decades before. Like most members of "the greatest generation" whose greatest feats came after they left the service, Sarah's greatest contribution to our country came not in radio repair rooms, but in the classrooms of Dublin High School, where this meek, gentle, kind and caring teacher shaped our young minds and taught us the theorems of life. So on this Veteran's Day, please join me in saluting Mrs. Sarah Austin Frost, the most unlikely Marine sergeant I ever knew. And for the rest of you men and women who have served our country in the Armed Forces, I thank you on behalf of a grateful nation for a job well done. This is a story of a Laurens County man who fought for the freedom of his country and the freedom of his people. Herndon Cummings was a member of what has collectively been called the "Tuskegee Airmen." Though he was not a part of the highly acclaimed circle of fighter pilots, Cummings served as a pilot in a bomber group which trained in the United States during World War II. In the waning moths of the war, Cummings found himself embroiled in one of the war's most controversial, yet unpublicized, instances, the first major attempt to integrate an all-white officer's club. 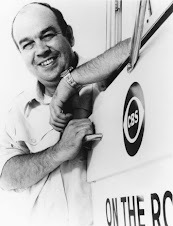 Herndon M. Cummings was born on April 25, 1919. The son of Joseph and Mollie Hill Cummings, Don grew up in the Burgamy District in the Old Macon Road area of northwestern Laurens County. Don was a grandson of Rev. Daniel D. Cummings, who saw to it that all of his children were educated. Many of his children excelled beyond their high school training to become professionals in a day when few blacks did. Cummings said his interest in aviation was sparked on Christmas Day in 1928 when his father gave him a toy German zeppelin. His interest in flying was forever sealed in 1936 when Don and his brother took a five-dollar ride in a Ford Tri-Motor plane. As the plane soared in the skies west of Dublin, Don underwent a life-altering experience. "By the time the plane landed, I knew what I wanted to do," he recalled. Like many other teenagers of his day, Don Cummings wanted to fly. The problem was that there were only a scant number of black pilots who had the means or were given a chance to fly. The United States Army Air Force instituted what was deemed "The Tuskegee Experiment." It was a program, thought by many to be designed to fail, to train black pilots to serve in Europe during World War II. Don Cummings enlisted in the Air Corps on June 25, 1942. He listed his occupation as a carpenter. For nearly two years, Lt. Cummings trained in the B-25 bomber at Tuskegee and later at Lockbourne Air Force Base in Columbus, Ohio, where he would later make his home. Of the nine hundred to a thousand men who successfully completed their training at Tuskegee, most trained as fighter pilots in the P-51 fighter and other fighters. These men, who have been immortalized in books and films, were assigned to the 332nd Fighter Squadron and saw action in the skies of Europe during the last months of the war escorting long range bombers. These brave young men were credited with losing none, or only a very few, of the fighters they escorted. Lt. Cummings was assigned to the 477th Bomber Group. The 477th was organized at Selfridge Army Air Field, Michigan in 1944. Many of the members of the group were commanded by white officers, who according to some, favored white officers over the black officers. Concerns over racial troubles in Detroit forced the group to move to Godman Field near Fort Knox, Kentucky. By March 1945, the 477th was uprooted again and moved to Freemen Army Field at Seymour, Indiana. In 1940, the Army published a regulation that any officer's club must be open to any officer, three years before the Tuskegee Airmen received their commission and long before the government officially ended segregation in the armed forces. The field at Freeman maintained two clubs, one for supervisors and one for trainees, but were defacto separated between blacks and whites. In the early days of April 1945, the relationships between the commanding officers and the black pilots began to deteriorate rapidly. Some five dozen were placed under house arrest. The men were released, but field commander Selway determined that all of the black pilots were to be designated as "trainees" and were assigned to their own club building. It so happened that all of the trainees were black and the white officers had their own building. On April 9th, all pilots were asked to sign a pledge to comply with Selway's directive. Lt. Cummings joined one hundred of his fellow pilots and refused to sign. They were arrested on the day President Franklin D. Roosevelt died. "The regulations said we could go in but the commanding officer said we couldn't," Cummings said. He added, "we just wanted a beer, why else would we go there?" The men, known as the Freeman Field 101, were taken back to a jail at Godman Field. They remained in jail for twelve days. Cummings gave new president Harry S. Truman credit for their release. "We thought it was the end of the line, but President Truman did the right thing," Cummings said. "We fought on both sides of the ocean. We fought on this side for civil rights," Cummings told an interviewer. "I am sure we did the right thing. To me and a lot of other people, it was the beginning of the civil rights movement," Cummings said. He also credited Eleanor Roosevelt and Thurgood Marshall, lead counsel for the NAACP and a future Supreme Court justice, for the effort to drop the charges of mutiny. It would be five decades later when the official letters of reprimand were purged from the personnel files of the Freeman Field 101. Just weeks after they were freed, General Hap Arnold replaced all of the white officers in the 477th with black officers. Lt. Cummings was promoted to captain to command a bomber. The unit was temporarily assigned to Godman under the command of Col. Benjamin O. Davis, Jr., the former commander at Tuskegee and a graduate of West Point. Col. Davis was given the task of preparing the 477th for deployment to the Pacific theater where it would participate in the impending invasion of Japan. The dropping of the atomic bomb ended the war and the 477th never saw combat outside of the United States. After completing his four-year stint in the Army Air Corps, Cummings served in the Air Force Reserve and attained the rank of major before retiring after twenty years of service. Cummings earned a commercial pilot's license, but never utilized it because there were virtually no opportunities for employment of black pilots. He went to work laying bricks in order to support his family and send his two daughters to college. Cummings and his second wife Mildred lived in their South Wayne Street home in Columbus until she died in 1988. When he is able, Major Cummings appears at reunions and programs to honor the Tuskegee Airmen or to support aviation in general. He has never been bitter about his experiences in the military, stating instead that it wasn't too bad and nothing could keep a good man down. On January 20, 2009, Major Cummings was a honored guest of President Barack Obama and invited to watch the historic inauguration of the first African-American President of the United States. After a long and faithful life of service to his nation and his community, Major Cummings died of complications from lung surgery on July 2, 2009. His cremations were buried in Columbus, Ohio. As his star began to rise, Gingrich's successor as speaker, Dennis Hastert, retained Randy to act as his outside counsel in 1999. That same year, Evans was appointed by Georgia Chief Justice Norman Fletcher as a Special Master for the State of Georgia for a five-year term which ended in 2004. With Speakers Gingrich and Hastert on his client list, Evans became the logical choice to represent the Republican party in Georgia. His stock in the law firm was also on the rise. 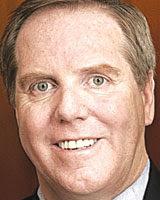 In 2001, he was named co-chairman of the Litigation Department at Arnall, Golden and Gregory. In 2003, Evans became chairman of the Financial Services practice group at McKenna, Long and Aldridge in Atlanta. He continues to try cases as well as author of hundreds of law articles as well as being a coveted speaker at seminars and legal programs. He finds that by writing and lecturing on legal issues, he is forced to keep up with the rapid changes in the law. In his spare time, Evans is a member of the Roswell Baptist Church, the United States Supreme Court Historical Society and the 11th Circuit Court of Appeals Historical Society. His wife Linda is a former Wall Street lawyer. He has a twenty-year-old son, Jake. His hobbies include chess and collecting lapel pins. He also enjoys following his beloved Georgia Bulldogs. He once told a reporter for the Atlanta Journal Constitution, "I bleed red and black." Old time Dublin High football fans will tell you that he was the greatest player ever to wear the green and white. With the possible exception of Tennyson Coleman, he is certainly the best Dublin player ever to play on the old Battle Field. But Charlie Bradshaw's success as a football player, first in Lake City, Florida, Dublin and later at Wofford College, was eclipsed by his success as a businessman and entrepreneur. Today, Charles J. Bradshaw, a former Dublin High quarterback, stands as a legend in the business community of South Carolina. Charlie Bradshaw, the fifth of six children of James W. and Florence Sanders Bradshaw, was born in Lake City, Florida on July 15, 1936. Bradshaw grew up in the sleepy community of Lake City, where he played football for Columbia High School. Bradshaw tells the story of how he was too young to work in the local tobacco warehouses. With the help of his mother, Charlie sold snow cones to workers at a profit superior to that of his hard-sweatin' brothers. When Charlie was a junior in high school, the Bradshaws made the 162-mile trip up U.S. Highway 441 to their new home in Dublin, where the elder Bradshaw worked at the V.A. Hospital. In his first year at Dublin High, Charlie was instantly popular with his classmates, who elected him as Class Secretary and Representative on the Homecoming Court. Charlie was a five-sport star in football, basketball, golf, tennis and track. There were no other sports for him to star in. In his senior season in 1953, Charlie was named the All Region quarterback and Mr. Dublin High School. But Charlie wasn't just a jock. He was a member of the Beta Club and the Spanish Club. Following his graduation from Dublin High School, Charlie went on to play football for the University of Georgia, the first Dubliner to play for the Bulldogs. A preseason injury just before his sophomore season forced Charlie to contemplate his future in Athens. After consulting with his coaches, his father and friends, Charlie, a back up quarterback, decided to transfer to a smaller school, Wofford College, in South Carolina. As he was in Dublin, Charlie was popular with his classmates. He was a member of the Kappa Alpha Fraternity and President of the Student Body. It was at Wofford, where Charlie's destiny as a quarterback and a businessman was set. With a fresh start in a new setting, Charlie, a member of the South Carolina Athletic Hall of Fame, excelled on the football field. In 1957, he was named to the All American Team for smaller colleges. In his primary wide receiver Jerry Richardson, Charlie found a life long friend and business partner. Charlie met his wife Judy Brewer on a wager with teammate Donnie Fowler. That bet turned out to be another one of the pieces of puzzle which led to Charlie's future in business. Fresh out of college with a degree in mathematics, Charlie married Judy in Rocky Mount, North Carolina. They set up their home in Spartanburg, where Charlie took a job with a local Ford dealership. At the request of his brother in law Joe Brewer, Charlie took a look at a hamburger stand in Rocky Mount. Bradshaw doubted that he could ever get rich selling 15-cent hamburgers and cokes and fries for a dime. But Charlie had a talent for business. He analyzed the sales and dreamed of franchising the restaurant across the Carolinas. So in October 1961, Charlie and Jerry, with his earnings from the Baltimore Colts, opened their first fast food restaurant at 431 Kenney Street in Spartanburg, South Carolina. The restaurant, the first franchise in the chain, was the popular Hardee's Hamburgers. The business began to grow. In 1969, Bradshaw and Richardson combined their business interests across the Carolinas and founded Spartan Food Systems, Inc., which went public and was listed on the New York Stock Exchange in 1976. In 1977, the company began to acquire numerous restaurants of the Quincy's restaurant chain and later a string of Denny's restaurants. At the peak of the ownership, Bradshaw and Richardson owned more than 600 franchises in a company which oversaw fifteen hundred more restaurants. The Transworld Company purchased Spartan in 1979. Charlie Bradshaw was named the company's senior vice-president in charge of food services, which included the Canteen Company, the largest food vending service in the world. 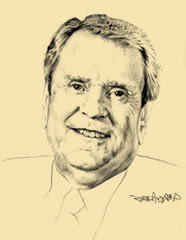 In 1984, Bradshaw was promoted to president of the company, which included among its holdings, Century 21, Hilton Hotels and Transworld Airlines. When the company's stockholders and directors opted to get into the nursing home business, Bradshaw felt it was time for him to leave the company, although many had been grooming him to become the company's chief executive officer. After a quarter of a century in the food service business, Charlie Bradshaw decided to go home, back to his family. He formed Bradshaw Enterprises to work with his children and teach them the business skills he had learned from the first day of the Hardee's in Spartanburg to the tactics of the boardrooms of one of the country's largest companies. Bradshaw was active in the Junior Achievement as it epitomized everything America stands for. Charlie believed in the program which followed the same ideals he used in his own business ventures and pushed it as a way of getting young people involved in business. More important, Bradshaw believes that they know the proper way to go into business and how to handle problems which inevitably arise. In 2001, Charlie took over the management of Team Sports Entertainment, which was the parent company of Team Racing Auto Circuit "TRAC." Though he continues to work today at the age of seventy-two, Charlie spends more time with his family and grandchildren and playing golf every chance he gets. To his friends, Charlie has always been known as a hard worker and a generous man. Charlie poured his efforts and his money into the Judy Bradshaw Children's Foundation for needy children. He supported the Spartanburg Regional Medical Center Foundation and the Boys Clubs of America. Charlie has been awarded the Distinguished Service Award by the South Carolina Jaycees, the Spartanburg Distinguished Citizen Award and Distinguished Alumni Award from his alma mater Wofford. In 2006, Charlie Bradshaw was inducted into the South Carolina Business Hall of Fame. Bradshaw attributes his success toward those he worked with and those who worked for him by saying, "I think the most important thing for any young person is picking his peer group, the persons he or she surrounds himself with. I don't care if it's his teen age years. I don't care if it's in his college years, business, or whatever it is. You are not going to be more successful than the people around you." 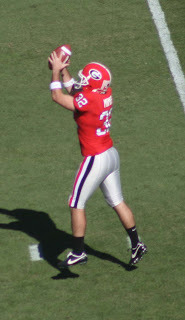 The “P” behind Brian Mimbs’ name on the Georgia Bulldogs roster stands for punter. It could stand for “perserverer.” For the last five football seasons, Brian, a former All-State kicker from Dublin High School, has triumphed over tragedies, Sisproved his doubters and conquered his competitors. Never losing sight of his goal instilled in him by his parents, this unpretentious and unselfish young man has quietly become one of the greatest punters in the history of Georgia Bulldog football. Brian Mimbs, the baby boy of Gary and JoAnn Mimbs, of Dublin, was born on May 19, 1986. Some considered his older brothers, Lee and Payton, to be better athletes. But, Brian discounts the notion that he and his brothers competed to see who was the best. “We all played at different skill positions in football and baseball and we never tried to outdo the other,” Mimbs said. Old time Dublin sports fans saw and still see something special in Brian. They will tell you that he was a very good athlete, very strong for his size, and as determined to succeed as much as anyone on the field, whether on the diamond or the gridiron. One highlight of Brian’s place kicking career came in a preseason game against the East Laurens Falcons. After his teammate called for a fair catch, Brian placed the football on a tee a yard on the south side of the mid-field stripe. The 2002 AAA All State kicker took the requisite number of steps back, stepped forward and booted the pigskin between the uprights for a 61-yard free kick field goal, the longest in Dublin history and one of the longest in state history, but one which will never appear in the record books. Middle Tennessee State offered Brian a scholarship to play both football and baseball. He turned it down. His father Gary urged Brian to play with the best and he thought the Bulldogs were the best team he could play for. “He inspired me to go to Georgia to follow and live out my dream,” Brian remembered, “and, I am grateful that I did.” Mimbs was given preferred walk on status with the team as a red-shirt freshman. For most of the next two years, Brian worked hard to earn a spot as the team’s place kicker. When the Dog’s holder went down with an injury, Brian, who had worked all fall as a backup, stepped up and went into the Auburn game to hold for Andy Bailey. From that moment on, Brian, who first wore the number 26 jersey, would be the team’s holder. He never muffed a single snap. It wasn’t until the final regular season game of his sophomore year in 2006 when he got the opportunity to kick off for the first time. But Brian had an empty feeling inside. His father died on the first day of summer. 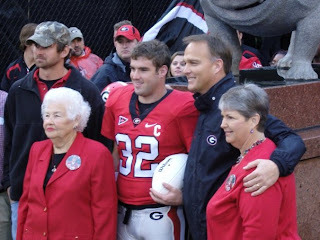 “When I went on the field for the first few times, I thought of my dad and how much he meant to me and how it was he that encouraged me to come to Georgia and kick,” Brian recalled. Mimbs kicked off twice against Georgia Tech that season for a respectable average of sixty yards per kick off. Actually, he had a third kick. It was in the Chick-fi-la Peach Bowl. With his team trailing Virginia Tech by the score of 21-6 early in the third quarter, Georgia coach Mark Richt sent Brian in to kick off after a field goal. Brian made his last career kickoff his best. He booted the ball at an angle into the artificial turf, sprinted toward it and cradled it like he was protecting a new born infant. Brian’s recovery of his own kick, a football rarity, ignited the Bulldogs, who went on score 18 more points and overcome the Hokies, 31-24. "At Georgia, I just wanted to make my dad proud." After thousands and thousands of summer practice punts, Brian was only promised that he had the first punt of the season. 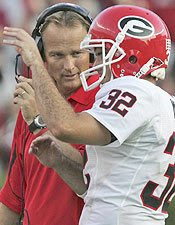 He was challenged in 2007 by Drew Butler, son of the legendary Georgia place kicker Kevin Butler. Brian welcomed the competition and went on the prove that his coach’s choice was the right one. In his first season, Brian ranked third in the SEC with an average of 42.4 yards, one of the ten highest marks in Bulldog history. Coach Richt asked Brian to make several kicks for the team by calling for angle kicks toward the sidelines. “It hurt his average, but he was a team guy about it,” the Bulldog coach said. During his career at Georgia, Brian counts as his most memorable moments as the punts he made from his own end zone. As a matter of fact, his first punt ever came out 42 yards from the Dog’s end zone. In his first game, he punted five times for a 42.4 average without a single one returned. Brian thrives on pressure. “It happened four times this year,” he recalled. And, on all four attempts, Brian boomed the ball high and long to bail out his team and give his defense good field position. One of those punts, a 77-yarder against South Carolina, ranks as the 6th longest in UGA history and the longest since 1973.
straight ahead, some six yards short of a first down. Perhaps Brian Mimbs most notable and unheralded Accomplishment at Georgia came not on the grass of Sanford Stadium, but in the class rooms. In 2007, Brian was named to ESPN’s All District Academic Team. In 2008, he was a semifinalist for the Draddy Trophy given for the nation’s most outstanding student athlete. From his freshman season through his senior season, Brian Mimbs was named to the All SEC Academic team, making him only the fifth player in the 117-year history of Georgia football named to the prestigious team for four consecutive years. Brian’s old coach, George Hagler, still stays in contact with his former pupil. “Of all Brian has done, I am most proud of this accomplishment,” Hagler said. "The Dog Walk before the game is an adrenaline rush. There is nothing like the feeling on a Saturday afternoon when you hear the crowd and know the entire Bulldog nation is behind you." This spring Brian is weighing his options and figuring things out. The Risk Management and Insurance major is sending out resumes and knocking on doors. He plans to work on his technique with a coach in Arizona and give the NFL a try. Who knows what the future holds for Brian Mimbs? So far, Brian has always put his best foot forward and got out of his life exactly what he put in, just like his momma and daddy always told him he would. Brian Mimbs holding and punting in the Troy State game, 2007. Scotty Thompson of the Courier Herald interviewing Brian after the Central Michigan game, 2008.